If you want your outing to be memorable and unique, Tulsa Stained Glass is the place for you. They offer a variety of classes good for individuals, or for groups. If you need a party, or just want to learn some arts and crafts, Tulsa Stained Glass has activities for both. The Rings and Things Class lets you make a stunning stained-glass ring project to take home, all in a fun 3 hour class. 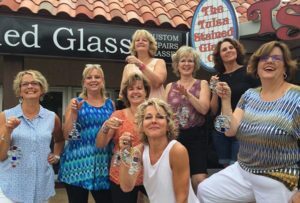 When you go, the wonderful people at Tulsa Stained Glass will show you how to make these decorations, using the tools and techniques they use to make their own stained-glass. They will teach you everything you need to know to make one of these lovely art pieces. If you enjoy free-form art, and are looking for something less serious, DoodleBohmBa is a perfect blending of finger painting and dance. DoodleBohmBa is all about having fun, and letting your creative juices flow above anything else. No matter the size of the group, Tulsa Stained Glass will provide all the needed supplies to make your own spontaneous painting. This event is lighthearted, and great for parties. Maybe you are in tune with nature, and if you are, then Garden Spirit Sculptures art classes are what you are looking for. It is said that Garden Spirit Sculptures protect your garden, and fill it with love and harmony. Make these metal and glass sculptures to your liking and to show off your personality. Add these to your garden, or anywhere else you think they fit, and they are sure to brighten up your home. For animal lovers, the Tulsa Zoo is where you will want to go. You can see 1500 animals from as many as 436 species all around the zoo, even from the café. If you are tired or just want to experience the zoo in a new and exciting way, the Tulsa Zoo has a train ride to get a closer look at the wildlife. The zookeepers are knowledgeable, friendly, and ready to answer your questions. Since their humble beginnings in 1927, back when they only had 35 animals, the Tulsa Zoo has grown into a hallmark of the Tulsa community. Furthermore, the Tulsa Zoo hosts several special events, including charity runs, Halloween events, and even movies in the zoo. They even serve as a venue for parties, such as birthdays, family reunions, and baby showers. Tulsa Zoo. The Philbrook Museum of Art is home to a sizable assortment of art from around the world. You can find Medieval art, Renaissance art, Modern art, and, the cornerstone of their collection, Native American art. With a smattering of jewelry, pottery, and basketry, lovers of Native American art will find much to love here. If you want to get some fresh air, the Philbrook Museum has a beautiful outdoor garden to walk through. The Thomas Gilcrease Institute of American History and Art, or Gilcrease Museum for short, dedicates itself to being one of the best museums for preserving and researching the history and heritage of America. Like the Philbrook, they house an impressive collection of Native American art, and other Old West paraphernalia. Furthermore, their archives are home to many rare historical maps, documents, and books, among other things. For art lovers and history buffs alike, you cannot do better than the Gilcrease Museum or the Philbrook Museum. If you enjoy popular culture, comic books, or video games, Tokyo in Tulsa is where you need to go. It starts in July, and is full of guests from all kinds of popular media. There is an “artist’s alley” (effectively a craft hall) where you can buy anything from Poky, to steampunk watches, to replica swords and lightsabers. For people who enjoy trading cards or tabletop games, there are places to play each of those too. For people interested in actors and musicians from tv shows, movies, and other media, Tokyo in Tulsa holds panels where you have an opportunity to ask them questions. Now you can find some fun and interesting insights to your favorite geek culture performers. Maybe you just want to relax and play some video games with other people who share your interests, they have numerous game consoles and stations where you can play them. For geeks, nerds, and lovers of pop culture, mark your calendars for July, because Tokyo in Tulsa is coming. For lovers of Bavarian culture, you can celebrate it during Oktoberfest Tulsa. Patterned from the original Oktoberfest in Munich, Bavaria, Oktoberfest hosts German bands, games, cuisine, and arts and crafts for your family and friends to enjoy. If you love food and beer, Oktoberfest is the place to be, with their decadent Bavarian cheesecake, bratwurst, and Bavarian beers of all kinds; you can listen to amazing music while toasting with friends and strangers alike. If you happen to be in Tulsa around Halloween, the Tulsa Zoo hosts a spooky, fun for the whole family trick-or-treat event called HallowZOOeen. If your family wants to do something special this Halloween, the Tulsa Zoo’s HallowZOOeen provides a unique substitute to more traditional Halloween festivities. More than 20,000 children attend, as proof that this event is a smash hit in the Tulsa area, and with activities like the Pumpkin Patch Playroom, treats at the Goblin Stops, and carnival games, it is no surprise.